Highly configurable backup program with intuitive explorer style interface. Performs full, incremental, differential and mirror backups. Has wizards for backup & restore, powerful file filters and scheduler. Creates standard zip files or exact copies of files, spans to multiple disks, keeps track of file versions, has built-in CD/DVD burner, backs up to FTP, backs up open files, sends email notifications, command line and AES encryption support. Backup4all Professional 8.0.120 is a shareware program and can be used as a demo to try the software until the free trial period has ended. A full version of the program is available after the trial period ends. 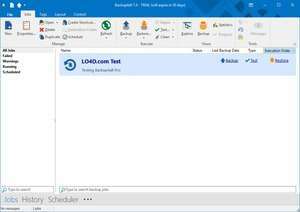 For security reasons, you should also check out the Backup4all Professional download at LO4D.com which includes virus and malware tests. Additional screenshots of this application download may be available, too. 3.85 out of 5 based on 13 ratings.